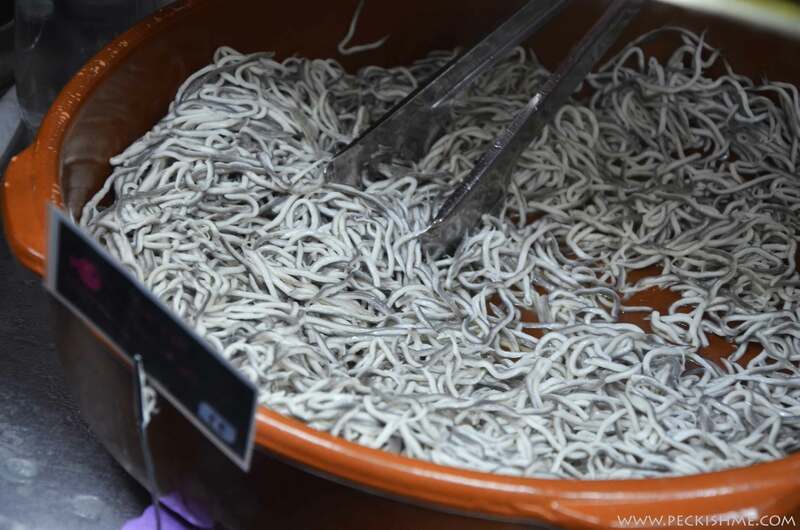 Spanish food took me by surprise. It took me by the hand, lifted me off the ground and set me amongst the clouds. I am in love. 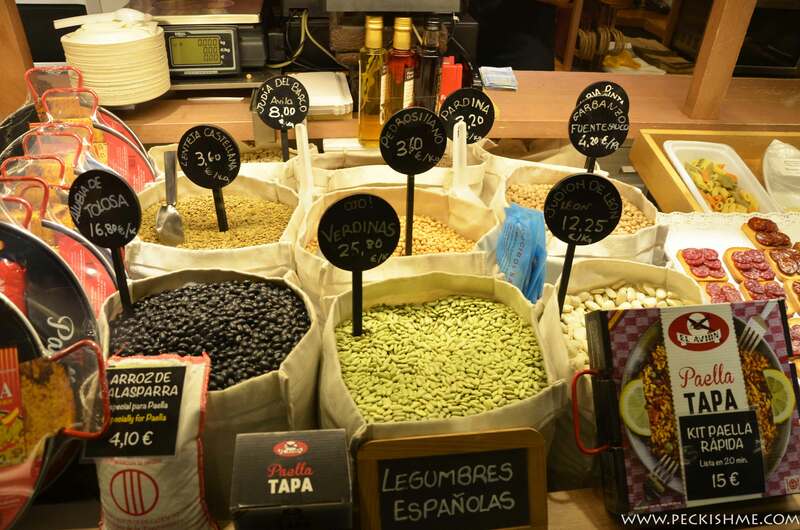 Spain is its food. The vivacity of flavour in Spanish cuisine is a genuine reflection of the liveliness of its people, their warmth and their love for life. Countless spices, condiments and elements tumble about with one another creating a different dimension of flavour that is truly incomparable to anything I’ve ever tasted in my life. That’s really saying a lot coming from the spice island of Sri Lanka! The two days that we spent in Madrid are two of the most magical days of my life. Listening to the music unrolling in the plazas while half a dozen onlookers start moving to the music quite unexpectedly, we would sit and sip at a Sangria or a cup of coffee, resting our tired feet after long days of roaming, just soaking up the atmosphere . The day starts late for the Spanish and often goes on till the wee hours of the night with residents eating, drinking and merry-making in the streets. The atmosphere is electric with energy and that energy is contagious. We have already been in Paris for 3 days before we headed out to Madrid and it was a welcome change from the cold and dreary French city with its cold and dreary people. (Yes yes so they say that Paris is not France but hey, first impressions are hard to get rid of). The sun was bright and cheerful in Madrid and lit up the cobblestone paved streets while abundant vines pregnant with flowers crept out from behind the walls and cascaded onto the streets. The weather was mild and at 4pm the streets were quiet – a welcome respite from the overcrowded Paris. We strolled hand in hand down the streets, gazing at buildings and just soaking up the atmosphere. Delicious smells were wafting from houses and restaurants along the roadside and we would smile to ourselves – this is life. There was a particular salted caramel aroma that seemed to be everywhere at one point. And this smell I would cherish in my mind for the rest of my life. Forget Paris, here is a city of romance and love. 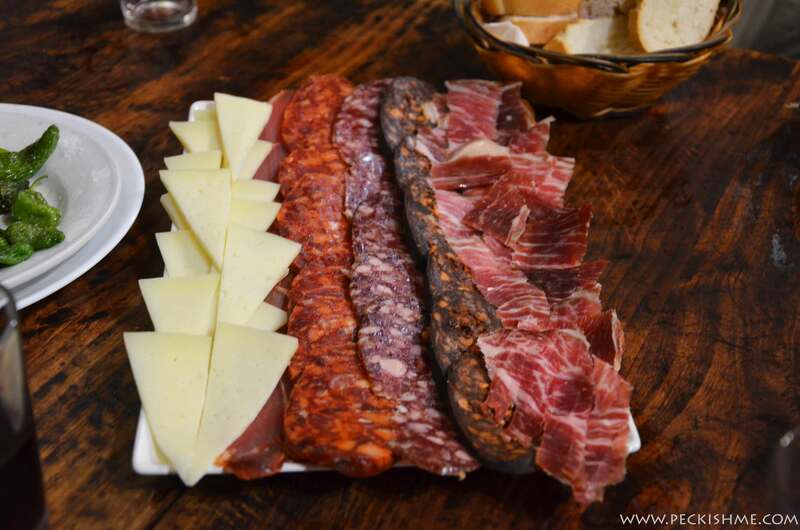 Spain in famous for its cured meats – chorizo, ham, salchichón – people take it seriously and execute it like an art with so much love and care. One often sees large legs of ham hung from the walls of restaurants and homes like prized trophies from which they like to carve thin slices of jamon and serve alongside bread and other tapas. 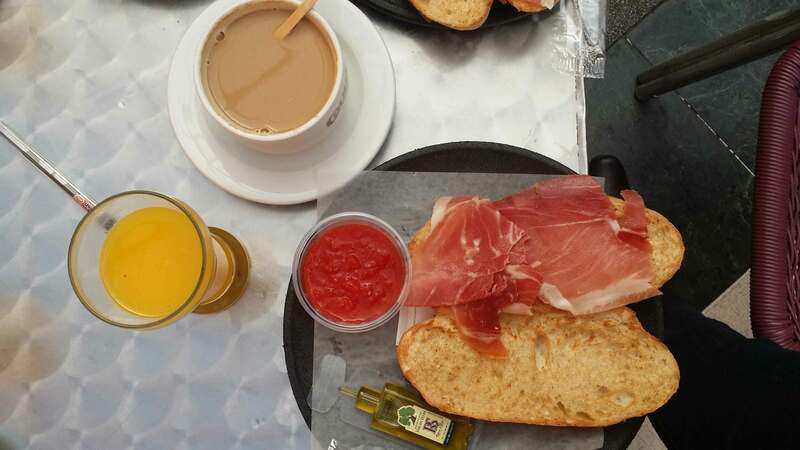 This was what we were treated for breakfast right after we landed – jamon with toastadas. 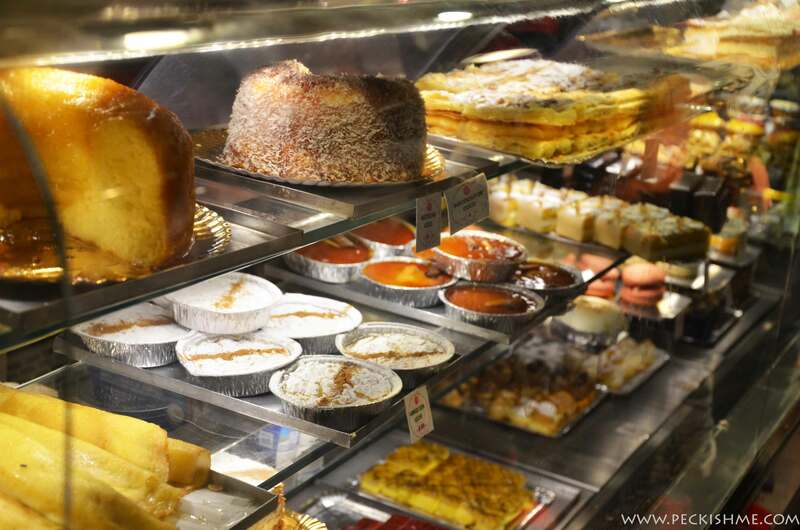 Our acquaintance in Madrid – husband creature’s cousin brother picked us up from the airport and whisked us away to what he called his favourite breakfast place. It was a lovely open air space in the middle of a shopping mall and by the looks of it, it did look like the whole neighborhood was breakfasting there. Thin streaks of jamon atop warm crusty bread served with olive oil, a cool and soothing salsa made out of the freshest tomatoes we’ve ever come across and a generous portion of extra virgin olive oil. it was served with a lovely cup of coffee and a glass of freshly squeezed orange juice. We were supposed to eat it with everything thrown in together, cousin said and we followed suite. It was just amazing. Clean, clear flavours beautiful in their honesty, ringing true on their own, amazingly resounding in their strength. After the rich, creamy, cheesy diet that was forced upon us in Paris for 3 whole days, this was indeed a little piece of heaven. The beauty of the jamon just shone through the freshness of the tomato and the greenness of the olive oil made it bloom. Now this is something I’d try at home. And all this was under 3 euros each! After the expensive Paris city, we were truly gob smacked. 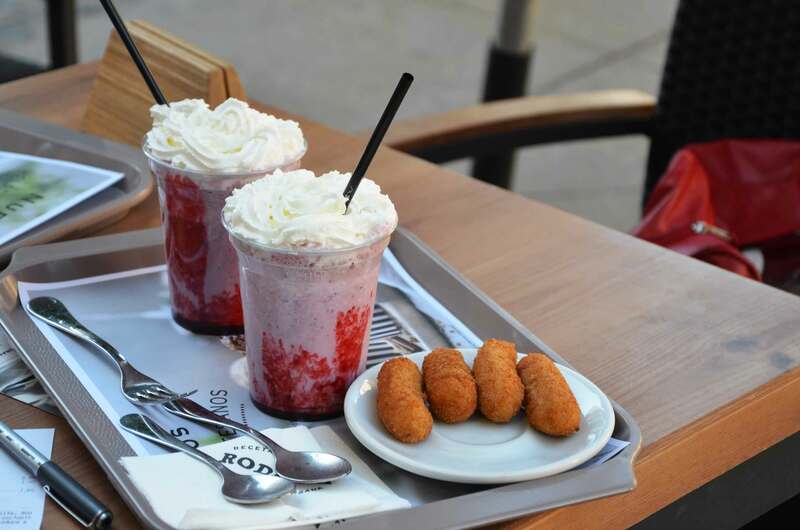 If you are in Madrid, or anywhere in Spain for that matter, churros and porras are something that you must absolutely try. Our insider in Madrid led us up and down many inside paths (which we would have not known had we travelled alone and would have easily gotten lost in) and led us to the left of the Puerta del Sol towards the world famous Chocolatería San Ginés, a little gem of a café that specializes in only one thing – chocolate con churros. The place is so famous that we had to wait in a line to place our order and the wait was definitely worth it. This is where the rich and the famous get their churros on when in Madrid and there was photographic evidence of it all around on the walls. Despite that, the place wasn’t flashy. Just simple and down to earth – true Spanish style. 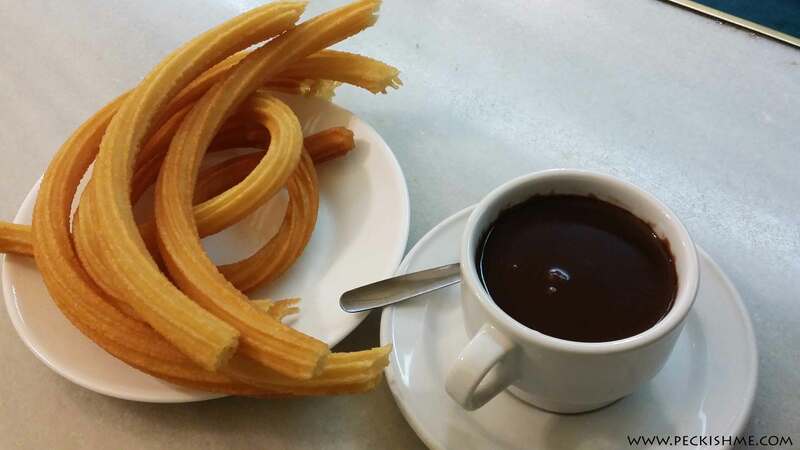 A steaming mug of thick, rich Spanish style chocolate came with 6 extra-long churros – all for around 4 Euros or less. We went in to the inside of the San Gines and settled down into its train room – I say train room because this long high room was structured like a train – and began our descent into bliss. Warm churros with a crunchy crust on the outside and deliciously moist on the inside were so yum on their own. When dipped in chocolate, the thick gooey substance sticks to the warm, crunchy sticks of dough and makes their way into our mouth, chocolate dribbling off our chins. Having an insider in Madrid is very helpful to steer you away from the touristic places and to lead you by the hand to the most intimate spots cherished by the locals. This is exactly what happened to us there. We were led into a very unassuming doorway which announced tapas and other things and then we were led somewhat underground to a cavern of sorts where people were sitting together in groups over drinks and tapas, having a good time. In the next room there was singing and dancing, a band was playing – perhaps a high school party. 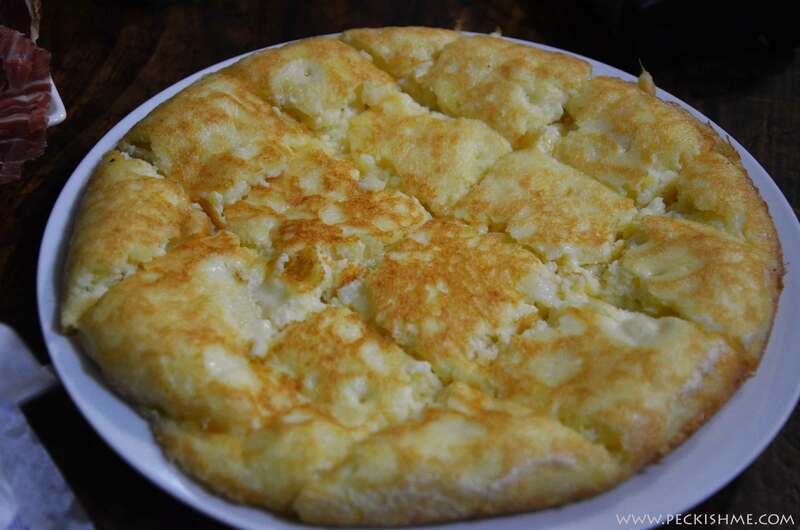 Our acquaintance asked us what we wanted and since we had no idea, we thought it better for them to order for us – traditional fare that a Spanish person would eat on a night like this. And so, a feast arrived at our table. 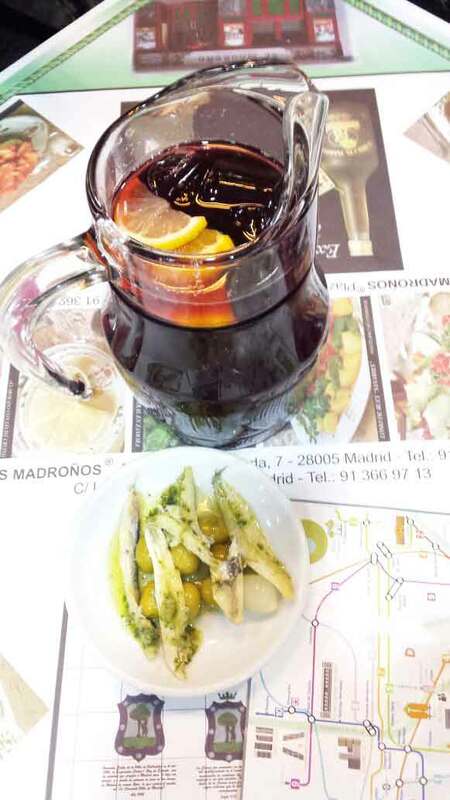 First came the Sangria – a flavoursome combination of red wine, brandy, orange juice, soda and various cut fruits such as orange and apple – gleaming red and tempting, afloat in ice cubes which we each lapped up by glassfuls. Then came the food. 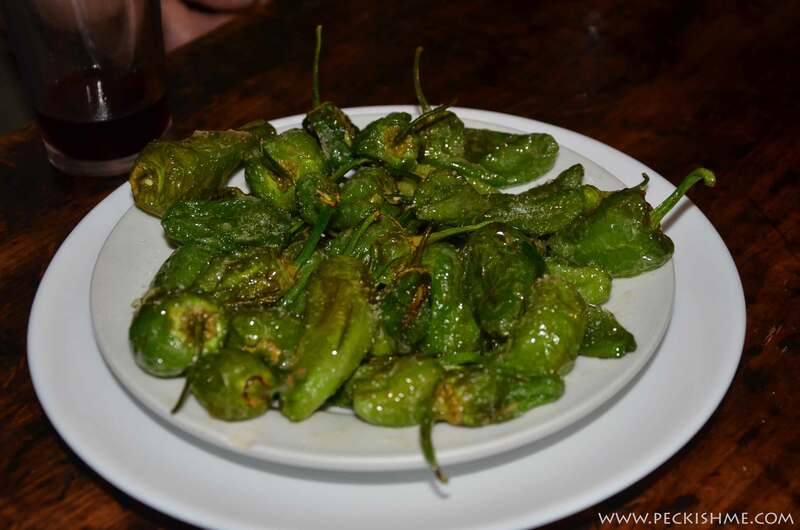 First came the fried green peppers, referred to as pimiento de padron. We were told that usually only one is spicy, but in this case, all of them were exceptionally spicy. I took precaution to remove the seeds and eat only the slightly charred skin of the pepper which was delicious and made a wonderful companion to the cool and soothing sangria. Half way through the peppers, the assortment of chorizo and hams arrived along with a basket of bread. It was a marvelous thing – the chorizos ranged in age and therefore in taste. The darker ones were aged more and therefore were more flavoursome whereas the lighter ones were mild and delicate. 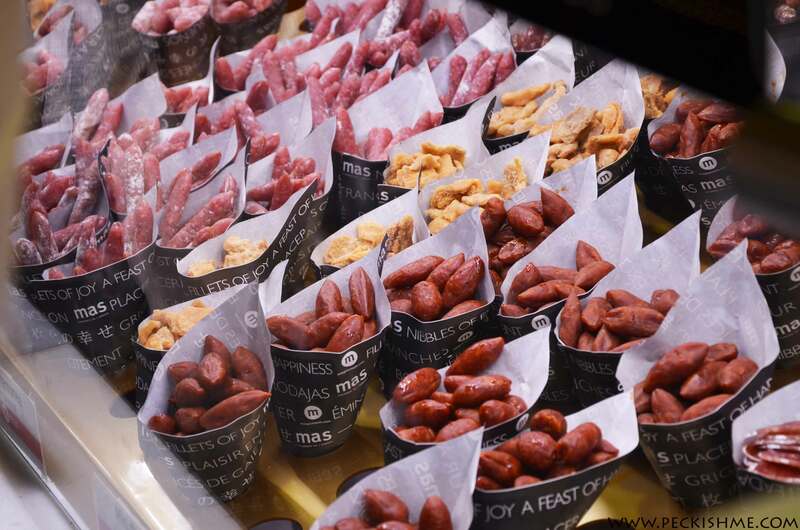 Chorizo is the emblematic sausage of Spain and its variety is truly astounding. Made with minced or chopped pork with fat, chorizo is available in both dry and wet forms, the dry ones being smoked or cured for approximately a week or so. Chorizo is available in ‘Dulce’ (sweet) or ‘Picante’ (Hot). Chorizo Duro is the hard, solid kind which has a sweet flavour and must be sliced very thin in order to properly enjoy it. There are many types of dry chorizo (all of which I could not taste, sadly). The ham, as is everywhere in Madrid was perfect. And the cheese, a hard emmentel was devoured with the leftover chilies which made a lovely combination. All this was washed down with sangria and one jugful was ordered after another without a second thought. 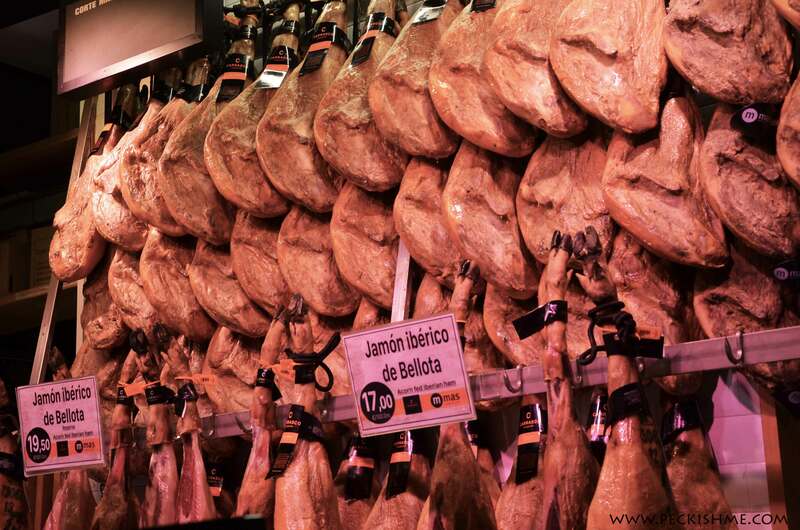 Jamon Iberico is the most loved ham of Spain and they could be spotted in plain sight at restaurants and supermarkets, displayed like prized trophies hanging from the walls and ceilings. Made from black Iberian pigs, the ham is delicately smoked and spiced and carries a lightly smoked flavour and is rather delicious on sandwiches or on its own. It is said that the ham is labelled as per the diet of the pigs and the percentage of the pig’s Iberian ancestry. Iberian purebred pigs on a diet of acorns are most cherished due to their superior taste. 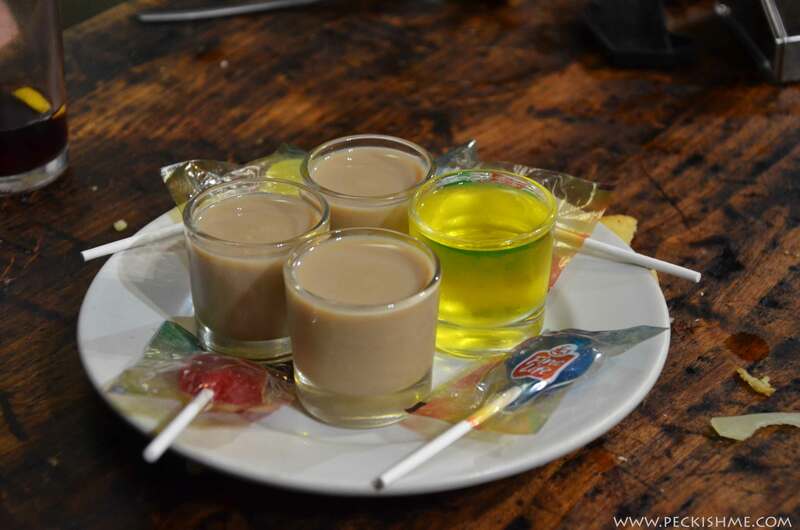 After our extremely fulfilling meal of tapas we were served with shots – hierbas, another new aspect of Spanish culture that we discovered that day. This is a uniquely Spanish digestive made from the essence of herbs (hence the name ‘hierbas’ such as thyme, fennel, Luisa herbs, rosemary, rue, lavender, chamomile, eucalyptus, juniper berries, marjoram, healthy grass, mint, leaves and peels from oranges and lemons and sage. We were offered two choices – with cream or neat. We all took with cream while hubby dearest took it neat. And boy was it strong! The creamy ones tasted a lot like coffee with a hit of alcohol underneath and it was lovely. Sweet herbs were laced right throughout although masked by the cream. Having it neat was the right way of really paying homage to the drink. Pity it escaped our minds to grab a bottle of this before we came back. This would have been a welcome addition in our collection. Sangria – is everywhere. 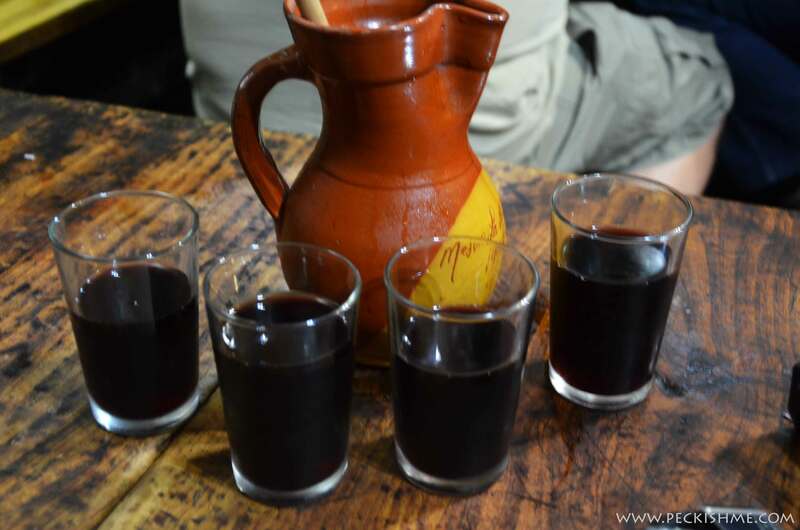 Not sure if it is a touristy thing or whether it is just culture, sangria overflows from every café, restaurant and bar and is served by jugfuls, not just glassfuls. Sangria traditionally incorporates red wine, brandy, sugar, orange juice and soda with sliced apples and oranges within it providing a fruity kick. It is stirred ideally with a cinnamon stick which sits in the drink for about an hour to provide flavour. And then, it is served with ice. Yum! A fruity, punchy, sweet treat extremely refreshing and I actually don’t mind this being served by the jugfulls either! Inspired by the visit (and also from a few VERY helpful tips from a local), I took it upon myself to re-create this amazing Sangria recipe right here. 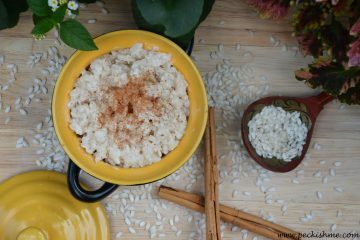 This is a recipe that I, to date, enjoy very, very much! Mercado de San Miguel just off Plaza Mayor is a bustling food market chockfull of tourists, albeit a rather expensive one. Despite the prices (which was more often twice the usual amount), the place represented almost all of Spanish’s exquisite foodie offerings and was an absolute delight. 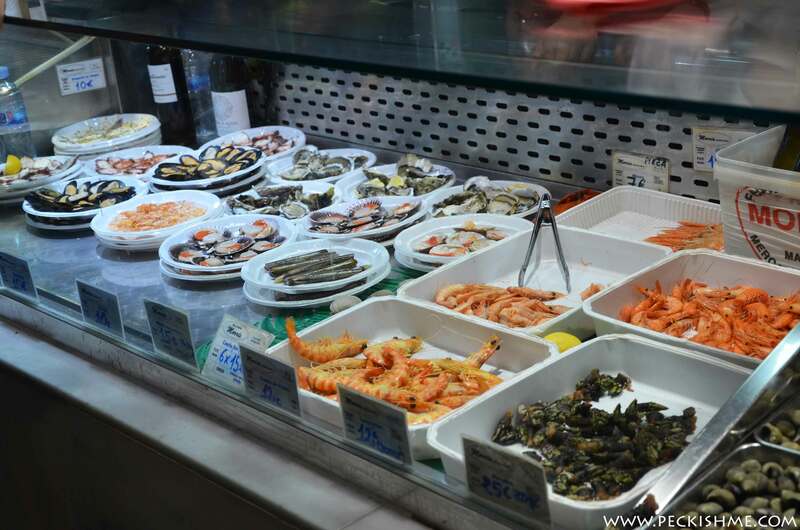 Seafood, sweets, baked goods you name it – all of Spain’s food representatives are there, albeit not the original versions – but it is a good place to start. 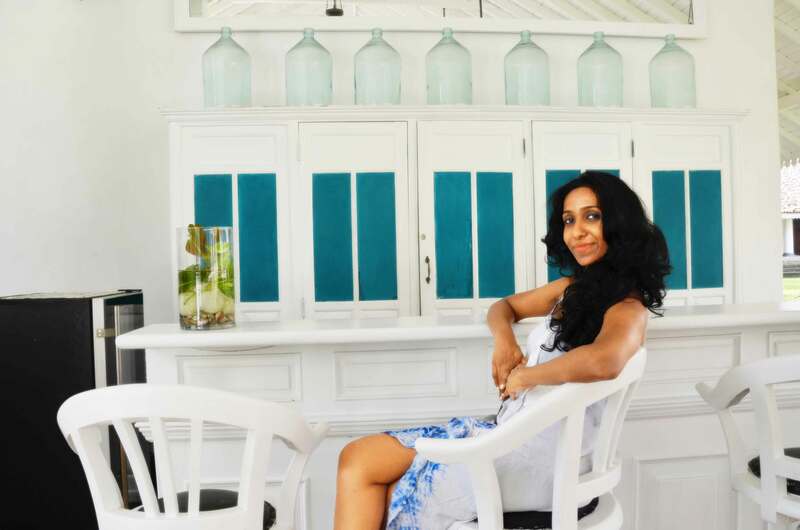 In the Spanish’s fondness of beans I find great similarities between Sri Lankan and Spanish cuisine – the importance lent to nutrition and their fondness of flavour as well as rice. The variety of beans they feature is just dizzying. 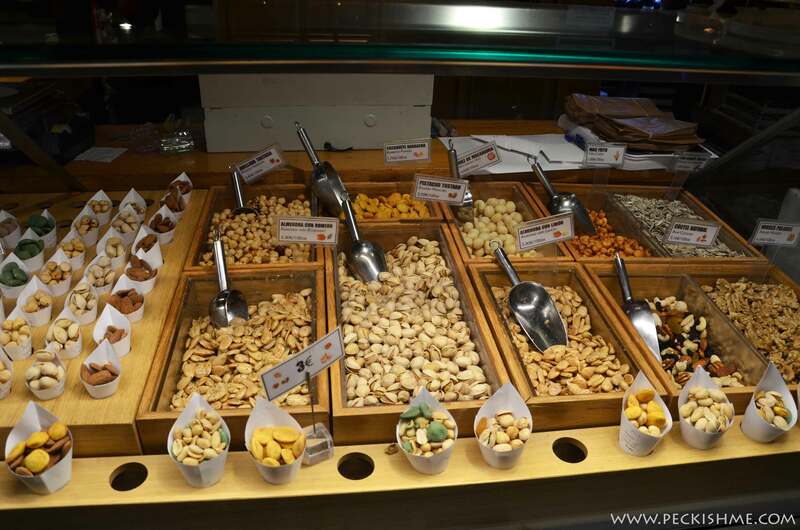 With all of this they prepare a myriad of specialties (which I unfortunately had no opportunity of tasting) which in addition to being delicious must be packed full of protein and nutrients. Some are mixed with intestines of cows – I was especially intrigued by the chickpeas, chorizo and intestines dish which was described as an extremely rich dish. 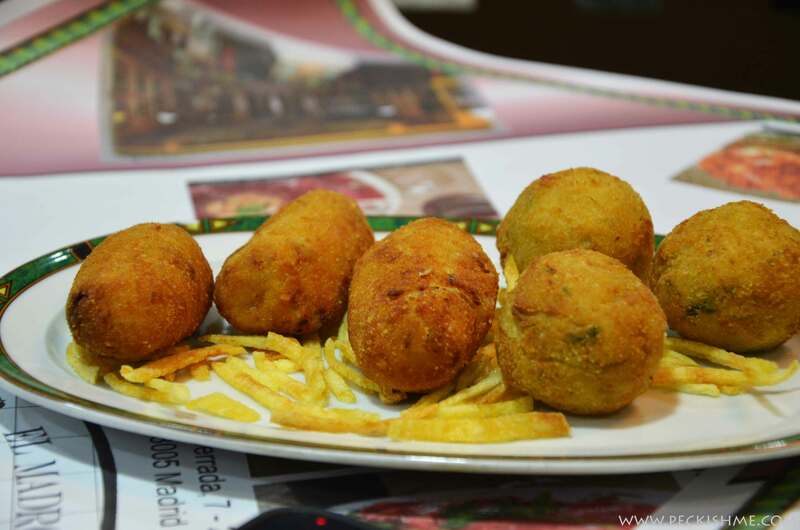 Croquettas are these small fried balls usually made of ham, fish or potatoes. The filling varies from one croquetta to another but the most popular as we have found is the ham in bechamel sauce. 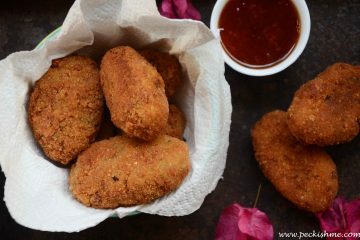 Crunchy on the outside and soft and gooey on the inside, these croquettas are packed with flavour but are quite mild at the same time too. Ever since we landed, Paella was on our minds. So we tried various paellas from various places and while some were rather good in terms of flavour, none really impressed us. And then we arrived at THIS. This monolithic, gigantic paella was served to us at a restaurant after a 20 minute wait and that wait was very well worth it. Full of calamari, prawns, chicken and clams, the Spanish medium grained rice is cooked to al dente in a chicken or vegetable broth. 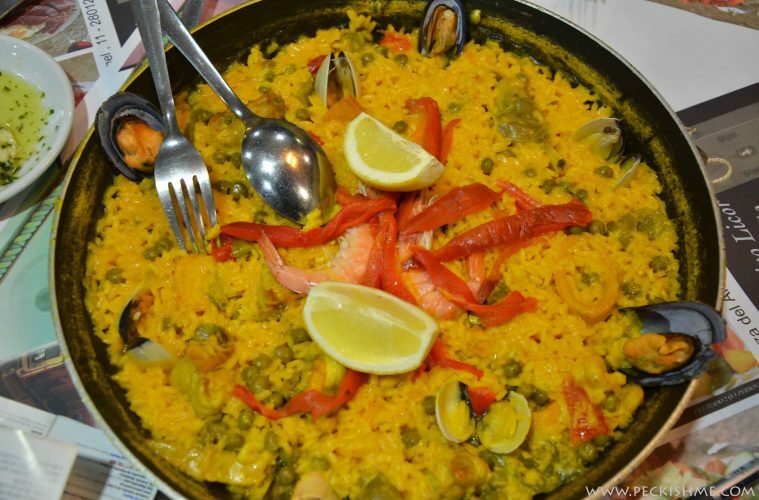 A sofrito – a slight caramelization at the bottom of the pan is the crown jewel of a good paella. The dish cooked in a shallow wide pan is eaten from the pan itself – in keeping with the communal spirit of Espana. While they say that the mixed paella is a tourist thing and that the real paella comes with rabit meat and snails and beans, I am more than happy being a tourist to eat this. In saying that, I would also love trying out the authentic deal one of these days, rabbit meat or not! I have Spanish saffron, Spanish rice and a good paella recipe in my hands and I’m just itching to make me some paella over the weekend! PS – I DID make it! Find the recipe here! 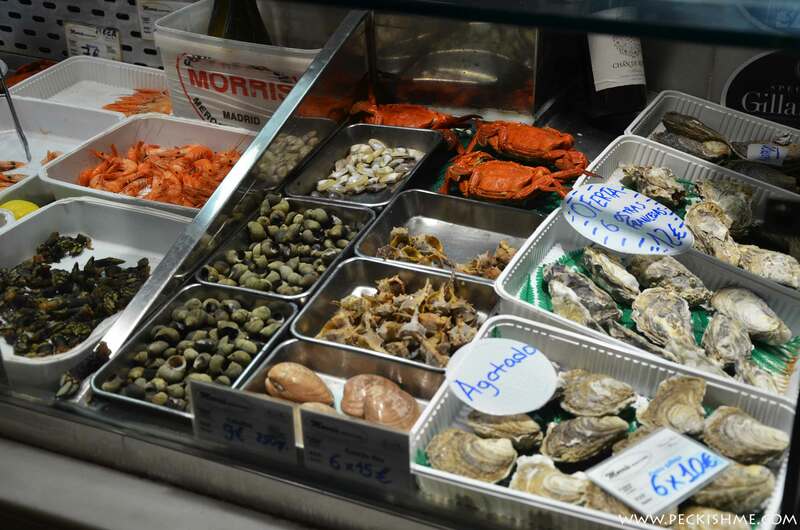 People say that France has the greatest food culture of all but I beg to differ – tasting the food, and a lot of it, in Paris and in Spain, I’d say there is absolutely no match for the food of Spain. 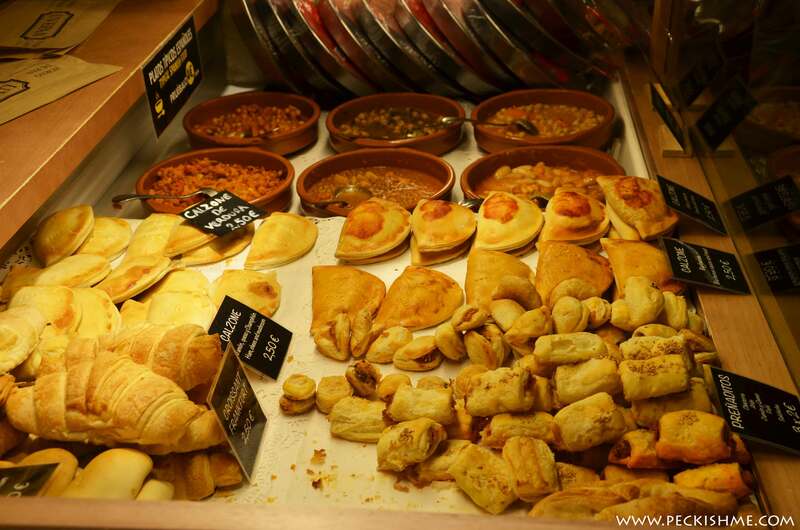 French food cannot hold a candle against the varied nuances, the incredible flavours, the astounding complexity of flavours that Spain represents in its cuisine. I hereby, I am sure to the heartbreak of many, crown Spain as the global culinary centre! If not for anything, I’d go to Spain just for the food alone! Side note – If you want to watch Flamenco, I recommend that you go to Seville, the birthplace of the art. When in Madrid if you still want Flamenco, look out for places where the names of the dancers are listed. You will be treated to choreographed Flamenco but that I suppose is better than no Flamenco at all. We witnessed a Flamenco performance at Casa Patas which had very good reviews but the servers were rude and 50 odd tourists were crammed into this tiny space and it was kind of uncomfortable. The dancers that night were quite good but I felt that they could have showcased better ones. (I am licensed to say this because I trained as a Flamenco dancer myself). There was more singing than dancing which was unfair because most were there for the dancing, not the singing. on your page ? I can provide hi quality articles for you.